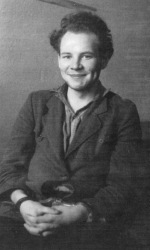 On this date in 1950On November 10, 1950?, 19-year-old gangster Werner Gladow was beheaded in East Germany for his brief but scintillating criminal career terrorizing the postwar ruins of Berlin. Young Gladow (German link) was just young enough not to get drafted as cannon-meat for the Red Army at the end of World War II, and just old enough to forge his own way as a crimelord when his conscripted dad returned from a Russian prison camp and started whaling on the family. Evidently, the boy had charisma to burn. Gladow soon gathered to his service a couple dozen young people doing a brisk business in black marketeering, stickup robberies, and kindred underworld phenomena, very soon to include homicide. He was a quintessential creature of the war-ravaged (but not yet wall-divided) capital, ducking between the city’s uncoordinated, rival jurisdictions for refuge. * The Gladow-bande‘s typical m.o. was a robbery in West Berlin, followed by flight to their base in the east. Stealing had become a routinized, everyday activity; for the parents, it was a source of guilt, for the children, it was neither work nor play, but pleasure … Their economic activity led to increased autonomy and self-esteem. Adult attempts to discipline the children with a now-discredited moral authority, enforced by local civilian police or foreign occupation troops, were unlikely to have much success. A sort of “freedom of the road,” in the old highwayman‘s sense. 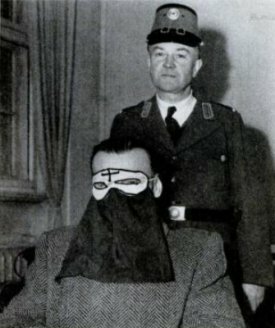 Former Berlin executioner and Gladow accessory Gustav Voelpel (Ministry of Silly Masks department) served time, as did Voelpel’s wife Martha. If our young Capone wanted a preview of his short life’s final destination, he had it readily at hand in the person of supposed assistant Berlin executioner Gustav Voelpel. At 1,000 marks a head, I can scarcely make both ends meet. preferred to use the axe in his executions as the guillotine was likely to jam after the second or third victim, whereas he never missed with an axe. And Werner Gladow ought to have asked him about that, too. We mentioned that Gladow’s base was in East Berlin. Unfortunately for Gladow, this meant that when he was finally tracked down at his apartment just after his 18th birthday — his 48-year-old mother was with him, firing from the windows — he enjoyed the rough justice of the Russian administration, married to the political exigencies of using the “youth amok” trope as a club to beat the West with. East and West German officials, like authorities in the Weimar Republic and the Third Reich, grew increasingly worried about the impact that American movies, jazz, and boogie-woogie had on German youth … East German authorities made highly publicized efforts to exploit hostilities toward American culture that existed in East and West Germany. During the 1950 trial of Werner Gladow, whose gang had engaged in a crime spree across East and West Berlin … officials and the press linked American culture directly to juvenile delinquency and political deviance. Setting a stern example for future ne’er-do-wells, Gladow was beheaded in Frankfurt an der Oder† on the fallbeil, the German guillotine (literally “falling axe”). According to the German Wikipedia account, the fallbeil actually failed to kill Werner Gladow the first time, and had to be re-dropped two more times. Wikipedia has the blade grotesquely lodging in the prisoner’s neck (non-fatally; he started screaming), which must have indicated some problem with the motion or lubrication of the mechanism that prevented its falling at speed, and/or an appallingly blunt blade. Gladow’s prosecutor, present to witness the festivities, fainted dead away. Unlike Gladow, he was alive again the next morning. ** Gladow’s own words as quoted in a press report of his trial in the Chicago Daily Tribune, March 25, 1950. † Far to the east, near the Polish border; not to be confused with the western metropolis Frankfurt am Main.